Berris Optical offers a great selection of nonprescription and prescription sunglasses for year-round eye protection and style. Our skilled staff will help you select the pair that's right for you. Prescription sunglasses are a must for anyone who wears prescription eyeglasses. We have many prescription sunglasses for you to choose from, with a variety of lens materials and frame designs. 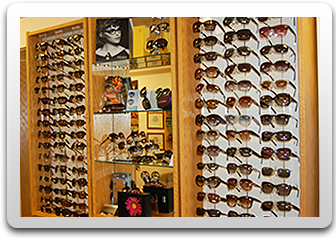 Choose from traditional prescription sunglasses, transition lenses, or clip-on prescription sunglasses. We'll work with you to find the pair that fits your lifestyle and vision needs. We also stock a large selection of high-quality nonprescription sunglasses. Every pair we sell meets our ophthalmic standards and blocks 100 percent of the sun's harmful UV rays. We carry sunglasses in every price point that provide this complete protection. We're also big on fashion, and we continually update our stock with the latest styles and colors. Stop in to find the designer names and trends you're looking for. Protective eyewear is essential gear for most outdoor sports or leisure activities. Performance and sport sunglasses are made from lightweight, durable materials. They're comfortable and stay in place, allowing you to play hard while playing it safe. We offer sport-specific and multipurpose sunglasses with interchangeable lenses. Come in today to get yourself ready for fun in the sun.